I’m a perpetual skeptic of “real estate disrupters”. I believe that Redfin and the other discount brokerages pick at the ~5% margin of sellers who would rather save 1% than have a good experience selling their homes. The massive boom of iBuyers seem to pick at the other end of the spectrum and cater to sellers who would rather give their homes away than put in some work to sell at FMV (less 6.5-7.5% in closing costs.) Because iBuyers are relatively new, we don’t know exactly what that market share is, but my gut is that it’s less than 5%. (Opendoor has been in Dallas for a few years and has ~2% of the market there.) So…it seems to me that these disrupters are fighting over ~10% of the market. Napkin math shows that iBuyers can profitably purchase homes at a 15-20% discount. Marketing this honestly doesn’t sell. “Click here for a free offer 15-20% below market” would have a pretty poor conversion rate. So, iBuyers market the same way Homevestors has for years: “Sell your home instantly!” “Instant offer!” etc (offering cash and time certainty)… From there, the consumer gets an offer price and then service fees tacked on in order to soften the blow. It’s somewhat of a bait & switch. As a savvy real estate veteran, I’m not surprised by this in any way. I’ve been curious how consumers would respond to it. After turning off my Adblocker a couple of months ago, I’ve been targeted by Opendoor and I’ve looked through their ads. A complete set of ads are available for review here. There were TONS of comments on this specific ad. A lot of the comments were clearly from agents, but many were clearly consumers. 90% angrily addressed the offer price the consumer received. 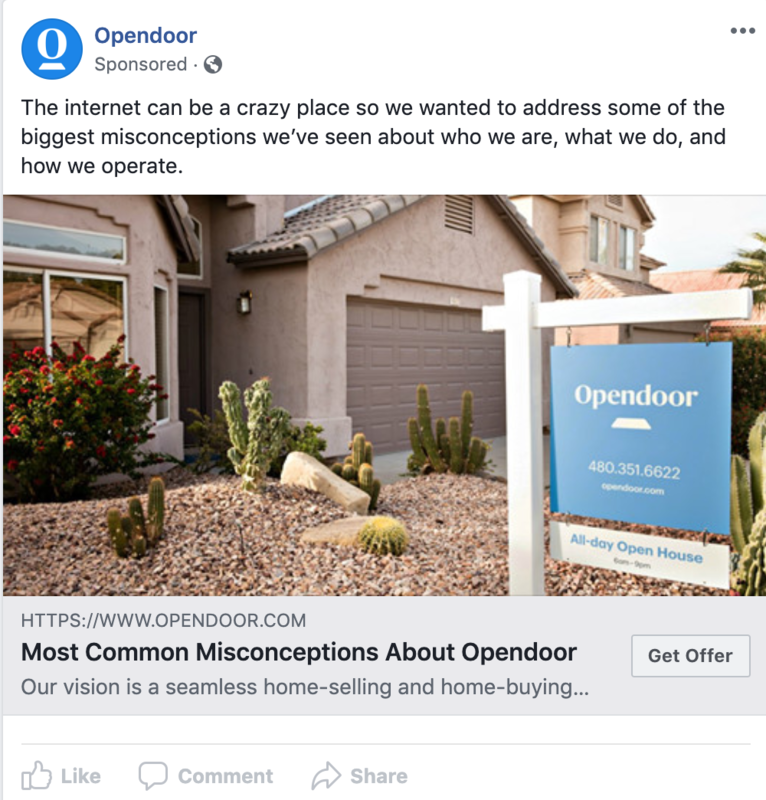 One commenter asked why Opendoor removed reviews from their Facebook page and Opendoor responded that they were moved to https://www.reviews.io/company-reviews/store/opendoor-com. Around 2 months ago, negative reviews started trickling in. Roughly 50% of their most recent reviews are 1 star and can be read here. It looks like the majority of consumers won’t be happy with below-market offers on their homes. When you couple the marketing message of “We’ll bring you a fast, fair, cash offer” with a borderline offensive offer, it seems that consumers get, well, offended.